5. Share images of groups (school groups, confirmation groups, sports teams etc.) with archives and libraries. Christmas is the time for sharing. Family photographs are not something to hoarded. They need to be shared. They need to be shared with your family. They need to be shared with newly discovered cousins. They need to be shared with complete strangers. Why? Think about that wonderful feeling you got when you first saw a new picture of one of your ancestors. Wouldn’t it be nice to let someone else enjoy that same feeling? Sharing digital images with my new cousins has reaped great rewards. One such cousin emailed me images of my grandmother when she was baptized and one of my great-great-grandmothers after I had shared some of my family photos with her. My side of the family never knew these photos existed. Imagine the joy my Mom and Aunt felt when they saw a picture of their mother as a baby for the first time—a photograph they never knew existed. Sharing digital images with others is a way of preserving the past. We have all read about people who have lost everything in a fire, flood, tornado or other disaster. Think about those one-of-a-kind photos, negatives or documents in your house. If they were destroyed, would you be able to re-create them or would they be gone forever? Recreating your collection with digital images wouldn’t be the same as owning the originals, but it would certainly be better than having nothing at all. Sharing digital images of groups with archives, libraries and historical societies can help other researchers find their ancestors. I was able to find a group photo of the employees of Joseph & Feiss Company in the Western Reserve Historical Society. My great-great Aunt Dorothy Hambrecht was in that photograph. What a thrill that was to find that photograph. 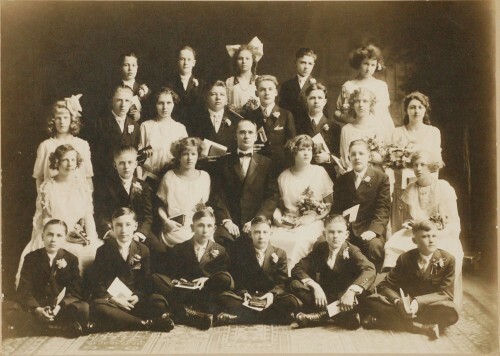 I have the power to bring that same joy to other researchers by donating digitized images or photographs of my Mom’s classmates, my Grandmother’s confirmation class, my Dad’s Middle School swimming team and many other group photos.